Once again, I found a recipe on the Epicurious web site - I have had great luck with the recipes on that site. 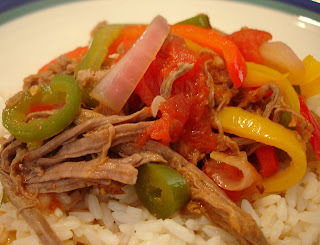 I learned that Ropa Vieja is a Cuban stew of shredded beef, onions, and peppers. Sounds good to me! Plan on spending 2-3 hours in your kitchen if you decide to make this. It was a lot of prep and time, but well worth it! 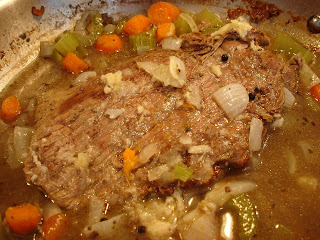 In a 5-quart kettle combine all braising ingredients and simmer, uncovered, 1 1/2 hours, or until beef is tender. Remove kettle from heat and cool meat in liquid 30 minutes. Transfer meat to a platter and cover. Strain braising liquid through a colander, pressing on solids, into a bowl. Return braising liquid to kettle and boil until reduced to 3 cups, about 30 minutes. Stew may be made up to this point 1 day ahead. Cool braising liquid completely and chill it and the beef separately, covered. In kettle cook green bell peppers, jalapeno, and onion in 2 tablespoons oil over moderate heat, stirring, until softened. While vegetables are cooking, pull meat into shreds about 3 by 1/2 inches. To onion mixture add shredded meat, 2 cups braising liquid, tomatoes with juice, tomato paste, garlic, cumin, oregano, and salt and pepper to taste and simmer, uncovered, 20 minutes. While stew is simmering, in a large skillet cook red and yellow bell peppers in remaining 2 tablespoons oil over moderate heat, stirring occasionally, until softened. We enjoyed this dish over white rice. I was so impressed with the flavors of the beef. 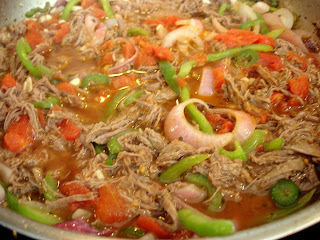 Adding the beef broth helped a bit, and I'm also glad I added the jalapeno. This dish isn't supposed to have heat, but since we like heat, I think I'd add a sliced poblano next time. See the posts below for the salad I served with the meal as well as our wine choices for the evening..
Yum! 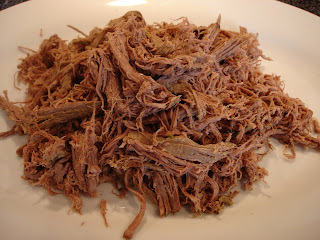 I love ropa vieja, it looks delicious!